The physiography of southwest Michigan is characteristic of a mature glacial outwash plain and moraine complex. During the advance of the last Wisconsin glaciation (ca. 14,500 yea rs BP), the Michigan lobe pushed southward and eastward along the basin of Lake Michigan. This ice mass was met by the Huron-Saginaw lobe that extended southeastward through the present Saginaw Bay and across the Lower Peninsula of Michigan. These glacial lobes caused great disturbance of the surface topography and upon retreat left a complex landscape of highly heterogeneous deposits. The result was a diverse depressional pattern of many kettle lakes interspersed among steeply undulating hills and outwash channels. Most of the lakes in southwest Michigan originated as ice-block depressions in the outwash plains formed from the melt-waters of the Valparaiso Moraine of the Michigan Lobe and the Charlotte Moraine of the Saginaw Lobe about 12,500 years BP. Dominant surface features are overlain with glacial outwash of mainly sand and gravel. KBS is located within the Gull Lake watershed of the Kalamazoo River basin; soils in the basin developed on glacial till and outwash and are correspondingly high in carbonates and vary from very deep, poorly-drained mucks to sandy well drained loams. Most soils are sandy loam and silty clay loams of moderate fertility. Fifteen soil series representing four soil orders (Alfisols, Entisols, Histosols, and Mollisols) have been mapped and characterized within the boundaries of KBS. Alfisols represent over 90% of the pedons described and are typical of soils developing on uplands under forest vegetation. 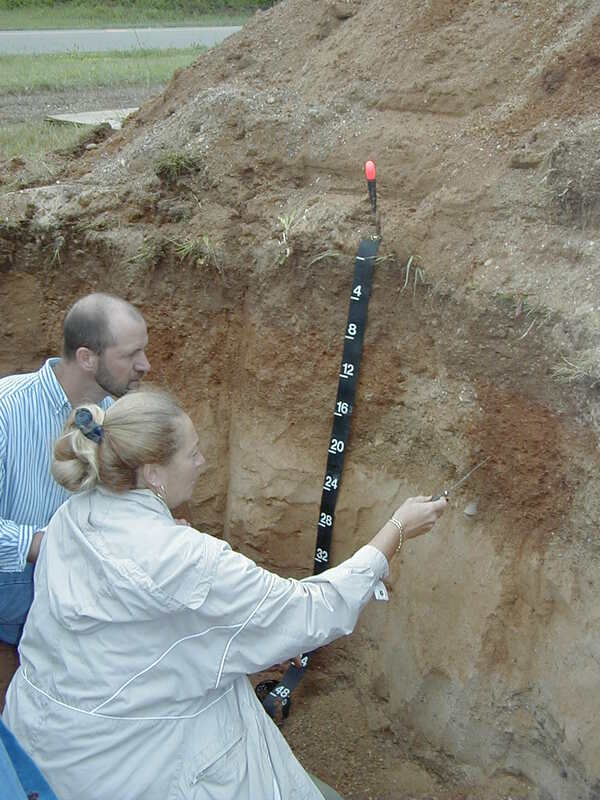 These pedons represent the most commonly described soil properties and are well established and recognized by the National Cooperative Soil Survey. Histosols and Mollisols are found exclusively in wet depressional areas characterized by poor drainage and the accumulation of organic matter. Entisols occur along drainages where the stratification of coarse sandy subsurface horizons reflects the deposition of sediments under changing currents and shifting channels during flooding. The dominant KBS soil series are the Kalamazoo (fine-loamy, mixed, mesic Typic Hapludalfs) and Oshtemo (coarse-loamy, mixed, mesic Typic Hapludalfs) series. These soils occupy nearly level to rolling slopes. The Kalamazoo series consists of well drained soils that are moderately permeable in the upper part of the profile and rapidly permeable in the lower part. The typical sequence of horizons is Ap, E, Bt, 2Bt2 and 2E/Bt. Textures of the Ap and E horizons are loam or sandy loam. The Bt1 is usually clay loam or sandy clay loam, whereas the 2Bt2 has a sandy loam texture. The E/Bt consists of lamellae of loamy sand (Bt) and sand (E). The upper 50 cm of the Bt1 plus 2Bt2 averages 18% or greater clay content. Soils developing in shallow closed depressions within mapping units seldom exhibit poor drainage in subsoil horizons but commonly have thicker and sometimes darker surface horizons with evidence of deposition of runoff sediments. Oshtemo pedons occur in close association with the Kalamazoo, generally occupying similar landscape positions. 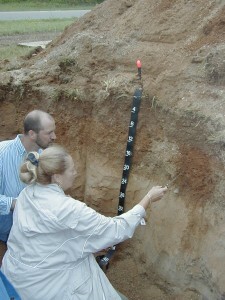 This soil can occur with or without a fine-loamy Bt horizon. If the Bt is present, the typical sequence of horizons is similar to that of the Kalamazoo soil with similar horizon textures. However, the Bt is thinner, and the upper 50 cm of the Bt1 plus 2Bt2 has an average clay content of less than 18%, thus distinguishing it from the Kalamazoo. If the fine loamy Bt is absent, the typical horizon sequence is Ap, E (sandy loam or loam), Bt (sandy loam), and E/Bt (sand and loamy sand). Suggested citation: Crum, J.R. and H.P. Collins. 1995. KBS soils. Available at http://lter.kbs.msu.edu/research/site-description-and-maps/soil-description. Kellogg Biological Station Long-Term Ecological Research, Michigan State University, Hickory Corners, MI.